Currently the Divi Builder can be used on posts, pages, and projects. Soon, that same power will be expanded to all post types. Last week we teased the upcoming Dynamic Content feature release. Having more robust dynamic content in Divi will bring us one (extremely important) step closer to some other really exciting features. One of which, is this week’s sneak peek: Divi Powered Post Types. 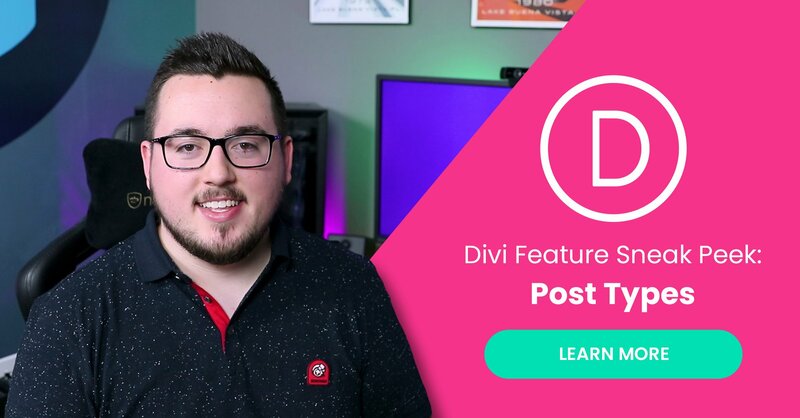 Divi Powered Post Types is part of a set of planned Divi Feature Releases we’ve got in store for you designed to bring the Divi Builder to every area of your WordPress website. And I’m excited to share that we’re already hard at work making this feature (and its other related features) a reality. 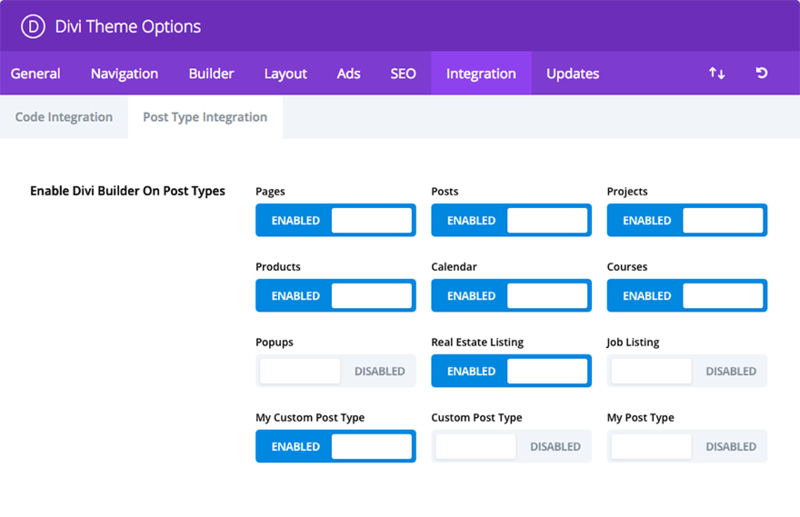 When we release Divi Powered Post Types you’ll be able to enable or disable the Divi Builder on any post type–whether it’s custom built by you or provided by a third party plugin–with a single click from Divi’s Theme Options. The new Post Types Management System being added to Divi’s Theme Options will make it easy for you to work with the editor of your choice on your website’s most important content. Whether that’s on event pages, product pages, course pages, or something else. When you enable to Divi Builder on the post types of your choice, all of the power of the Divi Builder will be added to the main content area of that post type. Making it easier than ever to design the exact layout you want for each and every piece of content on your website. When combined with other future feature releases, like dynamic content, you’ll be able to create dynamically updating, Divi powered, custom post type templates for every kind of website imaginable. We’re going to see new takes on Divi websites for car dealerships, online courses, job listings, events, and so much more. And that’s not even counting all the things you’ll be able to create with custom post types and fields! The possibilities will truly be limitless. Both the dynamic content update and the post types update are paving the way for yet another highly anticipated feature release: a Divi Theme Builder. For those of you who have been wondering (particularly in the comments of last week’s sneak peek) yes, we are indeed building up to a release we know everyone will be excited about: a Divi Theme Builder! As we said above and hinted at throughout last week’s and this week’s sneak peeks our plan is to bring the Divi Builder to every part of your WordPress website. Due to the nature of product development, we don’t like to put hard dates on these releases but we can assure you that our team is hard at work on all of these features and next week we’ll have even more details concerning Divi’s impending theme builder and what that will mean for Divi users. See you then! Divi Theme Builder! Thank you! Will that be 4.0? I’m not sure what version number that will end up being. So will this enable us to build our own product and listing pages for WooCommerce, where things like the featured image, price, product description etc are all separate modules? I’ve seen a few third party plugins who make that possible with Divi but it would be great if that kind of functionality is in Divi itself. And are we going to be able to build a new custom post type, along with custom fields, within Divi itself? I currently use ToolSet to do that, but again it would be great if we could do it within Divi itself. Products has to be woocommerce. I think we will still be stuck using toolset for creating new a new post type. This will need a blog module update for sure I think. What I hope happens here is that we can override base layouts for all major plugins like event, house selling, etc…. With a default DIVI install. I’ve been using WordPress for well over 10 years, but never found a reason to bother with CPTs until now with my new website. I then realised why I hadn’t bothered with them, once I saw how lackluster the CPTs + archive pages looked out of the box!! I came across Toolset a few days ago (which a couple of commenters have mentioned) as I was looking for a better way of styling CPTs + archive pages, etc. Only reason I hadn’t bought it yet, was because I was waiting until the weekend to sit down and get stuck into it. Then I see this blog post which effectively means Divi is going to be able to do everything I want, without the need to buy Toolset! If it is going to be at least a month or more away from release and many more until the more powerful features are added. Then I’d rather know so I can buy Toolset for 12 months and worry about the headache of switching everything over in the another 9-12 months when Divi is ready with these new features. Hey David, I’ve been using both Divi and Toolset on a few projects and my experience is that the two are complementary. While Toolset’s strength is creating CTPs and fields and pulling them from the database in specific ways through Views, Divi’s strength is a beautiful design. Toolset already has a decent level of integration with the current version of Divi. Though future Divi features sound great and perhaps will create a little bit of overlap with Toolset, my recommendation would be to go ahead with purchasing and learning Toolset as it could drastically expand the realm of possibilities available for your web projects. Yes, that will be possible. You’ll be able to use the Divi Builder on those post types and dynamically map the content you want to different modules with their own design settings. Are we going to be able to use custom search bar for thes custom tupes? Thats really inportant(if possible searching dynamically right away after changing values)? I think this may be one of the updates that I have been the most excited about this year! Can’t wait! What exactly is meant by a “Divi Theme Builder”? I know what the Divi Builder plugin is, and I know what the Divi theme is… but then what is a theme builder? The ability at the very least to create layouts for the header and footer area which is a not a DIVI theme default at the moment. We need a divi builder for the menu. 500% Agreement! Divi’s Header, Menu, and Footer (HMF) Customizations are the only areas that give my design team issues. Please… enable us to use the Builder for the HMF and Select Individual Prebuilt Sections from the Layouts. We don’t always need or want to import an entire webpage or website, we just need a Section to import into our webpage. This and everything else that Divi is doing is AWESOME! Can’t Wait for What’s Next! Keep up the Great Work! THANKS!!! And search result pages please! I was about comment the same thing. Look at avada theme, They have lot of different header styles. Divi need a flexible feature to make header the way we want. I am making a website now and the header is very complex, it is taking me ages to make that header in divi. Glory Hallelujah!!! This is what I have been waiting for for what seems like forever. Real CPT support. I’m assuming this means custom archive pages for, say, a restaurant review post type. I can’t wait. Divi has always had real CPT support. You just had to know how to code it in. This is a pointless feature if you already know how to do the proper steps. This is not a pointless feature as this needs to be a DIVI default. David, that’s like saying the blog module is a pointless feature if you already know how to “code it”. Isn’t that the point of a builder, so you don’t have to code it? Will the Divi dynamic content feature allow to perform calls on plugin’s custom fields? That is, for example, to create a Layout for a Woocommerce single product page. Yes, third party custom fields will show up in the dynamic content options. You can see how this will work by going to our dynamic content sneak peek from last week and checking out the UI mockup included in that post. Are we getting a Divi powered Ajax refreshing search and filter? This would be amazing for directory and listing sites! Basically an elegant themes version of toolset or facetwp. Sounds great. Does this mean we will be able to build more easily archive, authors’ and category pages etc. matching the overall the website’s design? Those will come in a separate update. But that functionality is coming to Divi too! I believe those would be classified as “taxonomy” pages. Glad to hear this is coming as well! This is my N°1 ! MUUUUUUUCH waited feature since day one. When to expect to see this come ? +/- How many month please ? Will we finally be able to remove the projects post type that is automatically created and used on none of my sites. You can remove it through a custom functions.php command. I’ve yet to use it, too. If there was a field in the Divi Options panel to change the CPT name and slug from “Projects” to something else, I would take advantage of the existing modules. Very cool. This Divi is in a class of it’s own and much better than anything else out there we have tried. One question: who is this charismatic guy? It’s nice to see new faces! That’s Matt Philie, one of our newest hires on the content team here at Elegant Themes! Famous YouTuber joining the Divi team.. nice. I just wish you would spend more time bug fixing. Almost all of the gazilion bugs I reported over the last two years still exist today. Sometimes I feel like I am doing QA testing for you with no real purpose. So for now, I can’t really get excited about all these new features. I’m in the same boat. All this will do is give power to people who don’t need it and cause even more bugs and bloat to the system than what already exists. I haven’t run into a ton of bugs, thankfully, but I agree with you from the stance of focusing on performance. My worry is that all these new features will slow down the builder. In recent weeks we nearly doubled the size of our development team so we can fix bugs and release new features at the same time without putting either on the back burner. So just because we’re promoting new features doesn’t mean we’ve forgotten about bug fixes! Thank you for the reply Nathan, that’s good news. I truly hope development gets to spent more time on bug fixing. I’d love to see that list and your hosting provider. I have no bugs with good hosting. @Nelson, no bugs? Call yourself lucky. Just lookup my tickets in the support forum with the below query and you get 90 Divi tickets. Not all of them are bug reports though, some are regular support tickets. Marked as solved doesn’t mean the issue is solved, it just means that support added it to the development queue and closed the ticket. Most bugs I reported are confirmed by support and not hosting related. Maybe it is because I am a former software tester so I might recognize a bug easier then you do. Divi is on it’s way to be a full innovation platform. I like the way these updates are being announced and implemented. Kudos to your team. You guys are leaving the competition in the dust! Will Divi be able to create the new CPTs, too, or will we still need to register the CPTs with PHP or a 3rd party plugin? I’m REALLY looking forward to this! I use CPTs and ACF a lot. Up until now, the one plugin solution has worked “Decent”. Being able to native CPTs withing Divi sounds amazing. I’m going to ask a really stupid question but what is cpts ? Looking forward to seeing this in Divi. Can already do it with Toolset Views but have to style out the meta and featured image if used in the post. Hope small things like this are addressed. Also, using Toolset, you can apply a global Divi template to the custom post and just have the regular back end WordPress dashboard fields to fill in, no messing with Divi, good for rapid data entry on large inventories. This sounds like a great feature…Although I havent put my money where my mouth is with divi yet, and without being negative heres why. I tried the demo, added a blog element to display some blog posts…great…but why cant i have a two column or four column layout (on a page with no side bar)….and why cant I have a list view? Ok…..I hoped thats coz I was being a total noob, so I contacted divi using live chat, the guy was helpful but pointed me to an article/video on the blog element….this didnt answer my question. So I resigned myself to thinking, if its so hard to find, and no-one can tell me where the features are, then it must not be possible. So getting to a point….my problem is with custom post types is, if we dont have alot of control on a simple blog layout, I cant honestly see custom posts having the configurability required to display list/grid/masonry post views. Then on top, have the customisation within the custom post view to show custom flield such as images in the ways we would need e.g. carousel, main and sub images below…and all the other possible ways we would need to make a custom post type feature truely worthwhile and without using it and feeling constrained for simple displays. We use toolset types/views and it opens you eyes to the amount of confguration options required to become really useful for many different projects, but the filters in toolset can be limiting despite the multiptudes of options, but I can see why its limited, because the amount of options needed to cover every conceivable option would be crazy and probably waaay too complicated for a regular person to use. To round off, im so trying not to be negative, i sooooo want divi to do everything i currently need, and if i was to be able to show a simple blog list on a full page in 2,3,4 colums and a list view I would have purchased a lifetime membership couple of days ago and waited for the divi theme builder (which is the big thing we need going forward)……please point out it’s me being an idiot and the blog list features are there…I will signup straight away! Again I would like to stress I’m not trying to be negative, I do love divi’s take on page building and think its the future, but I cant switch yet to divi until it can do the basic stuff we need for our projects. That sounds amazing. I wanted to create a directory, the other day I got the mail about creating directories and was like “wow, that is what I need”. But I was thinking, that I should use the library or something so I could create some kind of template… And now I see you are going to solve this too 😀 Great! I hope this comes out soon and I can use it. OK! This is addressing the woocommerce requests! Now I’ll be able to add necessary elements to the shop and product pages of Woo without having to code or use 3rd party plugins. This is a step in the right direction. I’m excited for this update to be released. Great work ET Team! I cannot wait for this although you can already do it with Divi enabler, toolset and divi for toolset. I have 10 sites built with “Dynamic layouts”. They also have forms so my users do not need to use the admin area they can update and add any post from the front end. Will we be able to create custom post types and add custom fields with divi? And any thoughts for creating a post form? I was waiting for this feature for a long long time. And finally, it’s coming. Cool! With the right web developer along with DIVI, anything is possible, literally! This really sounds great. How long will it take to release all this updates? Will this be a feature on the Divi Builder Plugin as well, and not just the Divi Theme, itself? I’ve been needing this feature since the beginning because I use CPT in all my sites and I’ve been forced to use 2 wp functions to solve it. I’ve used Divi in the past and really like it. I’m now working on a new project that involves having a customer/visitor fill out a short form, the answers to which need to determine the content they see once they submit. Will this new feature enable this? I am going to say that is a contact form module update and that is not what this all important update is all about. I can’t even… I just can’t. This is like dreams come true… Holy Cow! So question… how will affect including one-post-type inside of another? If create a Movie Review CPT and want to include it inside of a Blog Post, will the Divi pieces fight? Or fit? More than likely you will still need something like Toolset Views which can handle post relationships. Any chance of header and footer builder being included into this? That is what the DIVI Theme Builder is for. Watch out for the next teaser video for some more info on this. What an epic release to come! Can’t wait! Awesome Pawsome! Can’t wait for more video updates. Thanks bunches. So jazzed for this feature! Awesome! Divi is really on the right path. Keep up the good work guys! I am no longer a Divi user, please take me off this list. Hi Sarah, you can manage your email preferences via the link at the bottom of the email you received. Sorry to see you go! Divi theme builder? How about we get a header builder first? Or hopefully this “Divi theme builder” incorporates that? Oh man, I’m creating a solution with Pods Framework and Avada right now. I would give an arm for begin able to design my layout in Divi Visual Builder, pull content from CPT’s and assign those layouts to CPT. The “Content Management System” part of WordPress would truly come alive. Did a quick mockup with Elementor, but that seemingly only supports ACF at the moment. Cool! I really hope this will work properly with WooCommerce product pages. There’s a few customizations I’d love to make. Thanks for sharing the big news in such a nice way. Awesome! More third party plugins out the door! I’m happy. Please don’t break toolset though… still a great tool in many tight situations. I used Toolset with Divi and had an awful time getting started thanks to the Divi “Projects” category. After quite a lot of research and a number of tries I eventually had to disable and hide the Divi “Projects” post type category as I actually needed to use the “Projects” category in Toolset as that was the CPT I was using. I have mentioned this many times to date and requested that “projects” have a button to disable it within the Divi theme” or allow it to be called whatever the designer decides. I have had no answer on this at all. If you are going to be series about using CPT’s within Divi (and not just whether the builder appears within it, then this request really needs to be taken care of. As anyone needing a “projects” category in their CPT will go through the same level of frustration. And so I will ask again… How do you intend to handle the default “project” category that is currently included by default within Divi please? Hi, any release date for the update? So we have a release date for this yet? I need this functionality for an upcoming project. Awesome … I actually really need this Custom Post Type Builder Integration so bad .. any update when this part will be available? Really loving and appreciating how hard you work and bring new features to Divi all the time. You guys are awesome!